Credit standards eased considerably in 1Q after almost stagnating in 4Q. Both SMEs and large enterprises profited from the easing in standards and expectations are that 2Q will see continued easing in borrowing conditions. The easing was mainly driven by France and Italy and was caused by changing risk perceptions and increased competition. Continued increases in demand for loans from enterprises and households is a positive sign. As backlogs of work increase, fixed investment is the main reason for the demand for loans, together with the low interest rate environment. As the survey was conducted between March 15 and April 3, increased trade war concerns that impacted business and consumers negatively have already been factored in. This suggests that the impact on lending decisions has not been large. Perhaps most importantly, ahead of the ECB monetary policy meeting on Thursday, the ECB asked its ad hoc questions on the impact of QE and the negative deposit rate again. Compared to 3Q 2017 when the questions were last asked, the impact of QE on bank profitability has turned more negative. The impact on total assets has become slightly positive and the liquidity position has improved further. Both credit standards and terms and conditions of loans have continued to ease, albeit at a slower pace. The impact of the QE programme is therefore becoming smaller as it is scaled down. The negative deposit rate is showing less of a decline in impact on firm profitability, capital position and lending conditions. For the ECB, this survey should be encouraging. 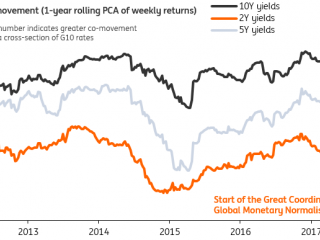 The effects of its accommodative monetary stance continue to support lending conditions and recent geopolitical tensions have not yet impacted demand for loans. With inflation still not showing any signs of getting closer to target, the ECB seems set to extend the QE programme once more, even though it is unlikely to announce that already on Thursday.